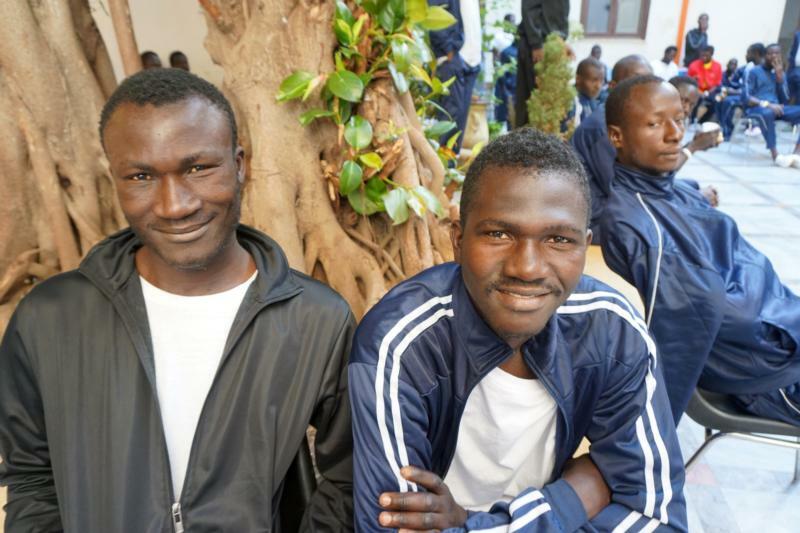 PALERMO, Italy (CNS) — Young African men crowded the courtyard, while others squatted on the cool, gray marble floor inside the Caritas diocesan facility near the gritty central train station of the Sicilian capital. These 150 were the latest survivors of the dangerous sea voyage across the Mediterranean from Libya as European Union leaders expressed alarm at the rising numbers of migrants flooding into Italy. The U.N.’s migration organization, the International Organization for Migration, reports that more than 1,850 migrants have lost their lives so far this year crossing between continents. Yahya, a Muslim auto mechanic who only gave his first name, said difficulties at home in the Ivory Coast forced him to flee to Libya, where he was beaten and could barely find food to eat before his sea passage to Europe. “I know God protected us. The sea was treacherous, huge waves rolled, tossing our boat like a toy. I thought I was going to drown,” he told the Catholic News Service, still shell-shocked from the trauma. “We’re in the midst of an emergency,” Caritas staffer Nadia Sabatino told CNS. An engraved wooden plaque adorns the simple office, depicting Jesus’ story of the Good Samaritan, who tended the wounds of one robbed and left bloodied. To many, it seems a fitting testimony of how the international Catholic charity is helping the desperate who reach Italian shores in search of a better life. A voice in the courtyard called off numbers in English, numbers assigned during the migrants’ entry registration to Italy. “299. Sudan. Come. Come,” a Caritas volunteer urges, as each collected dinner of rice, peas and beans. Squawking seagulls and church bells overhead punctuated the boisterous chatter, while other waiting migrants from a variety of African nations played a makeshift game of checkers using cardboard, with bottle caps of blue and white for pieces. “Often, they escaped from conflict or poverty, and they want to work to send money to their family back home,” said Sabatino, who studied counseling and sees her Christian calling to help the migrants. “They faced great dangers in Libya, often involving physical, psychological and sexual violence,” she said. For the sea voyage, money is extorted by traffickers, who send the migrants out in unsafe boats. Sabatino said the wait for asylum papers for those who make it to safety in Italy could take up to three years, if granted at all. That’s where other Caritas communities get involved in providing longer-term housing, meals, Italian language classes and programs to help integrate migrants into Italian communities, Father Vincenzo Cosentio told CNS. He directs Caritas Sicily’s programs in eight towns, including his home parish in Piana degli Albanesi, one of the few Italian communities to house both Roman and Byzantine Catholic churches. “Yes, some call me, Papa. Perhaps when they see me, they think of their fathers, parents left behind,” he said. He warmly greeted the migrants with hugs and careful listening during a visit to Palazzo Adriano. The picturesque town in central Sicily, surrounded by rolling wheat fields, is where the 1988 movie “Cinema Paradiso” was filmed and is the site of two different Caritas facilities. One is for new arrivals. Another is for those who have been waiting for months, hoping to get necessary documents to remain in Italy for work or to permit travel elsewhere in Europe. Caritas Sicily houses, feeds and provides protection to some four dozen migrants from Africa and Bangladesh. “We help them with all the things that they need when they first arrive. They are free to practice their religion and pray according to their faith,” Father Cosentio said, as a few of the men rolled out a colorful carpet to perform prayers during the Muslim fasting month of Ramadan. An 18-year-old youth from Ghana named Innuca said the generosity and kindness given by Caritas and what he faced in Libya could not be more different. Antonio Reggio, coordinator of the protection center in Palazzo Adriano for the past four years, told CNS: “I love my job because I speak with these boys. I feel like a father, like a brother, a psychologist. “Many are good boys, some of them lost their parents. Others carry the burden of their families pinning their hopes on them working and sending money home. They experienced a hard journey coming here and now uncertainty. We provide hospitality and support,” Reggio told CNS. “Now, these men are working with the community to clean the town and are helping in other ways. It’s very good and positive,” he said. “The project seeks to integrate the migrants in Sicily, in Italy, and to provide training needed to find a job,” Reggio said. Father Cosentio said most migrants now land in various points in Sicily, rather than on the tiny island of Lampedusa, where the initial influx appeared. He lamented that more and more people are risking their lives on a dangerous journey and an uncertain future in Europe. “It would be better if we could help the people in their own home countries,” he said. “I wonder if something needs to change. I have been hearing these same sad stories over and over again,” echoed Mariangela Giordano, who has taught Italian language to the migrants over the past seven years.